Many of our members attended the Apology in Canberra, the Melbourne screening and others watched it at home….see below for personal accounts. Video footage of the day will be used to create a commemorative DVD. 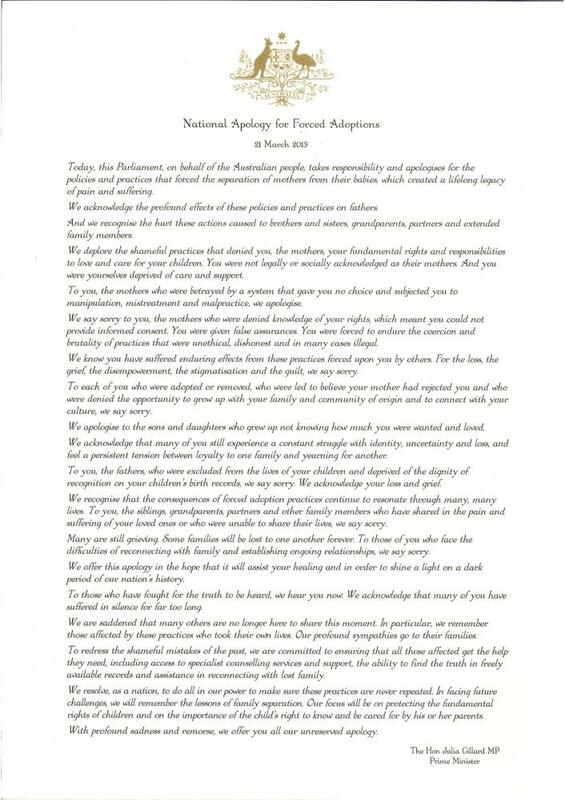 If you would like to be sent a copy of the DVD, an apology parchment, a commemorative lapel pin or an mp3 version of Mia Dyson’s song Jesse, please email your name and postal address to forcedadoptionsapology@ag.gov.au or call (02) 6141 3030. We are wanting to make flags (yes more) to donate to Canberra as part of our commemorative memorial for the apology. Please come along to our flag making sessions before each support group meeting to help out. We want to make a valid presentation of new flags. These will also be seen in the future by those who do not understand our present. I was there – a simple statement but it was a profoundly moving occasion. Over 1000 people packed the Great Hall in Canberra. We received Julia Gillard’s comprehensive, perfectly crafted and compassionately delivered Apology and responded with a standing ovation. Just before the Apology, a member of ARMS, who had attended alone, was tapped on the shoulder by her estranged daughter. They clung together with smiles and tears right throughout the day. We applaud the Federal Government for their National apology today. It has been a long time coming and unfortunately, for many, it has come too late. For the rest of us – nothing can give us back the lives we could have lived – nothing can change the past – so now is the time to focus on the future A National Apology will finally acknowledge the truth of the cruel, often illegal past adoption practices that forcibly removed children from their mothers. It will also acknowledge that these mothers were denied their rights and in many cases, given no option but to sign adoption papers. These mothers always loved and wanted their children. We hope that this Apology will educate and bring understanding and change to the community and particularly all those touched by adoption. Nothing can change the past, but our loss and grief does change when acknowledged. We are hopeful that this Apology will bring healing, reunion and peace to the hearts and minds of all those separated by past adoption practices. To all those who have worked so hard for the last 30 years to bring about this apology I offer my heartfelt thanks for your strength, courage and determination to expose the truth.